NOTE: There is a similar hill-run on the north side of town, up the Lindberg. Just take Lindstrasse north, cross the bridge over the railway, then turn right onto Haldenstrasse and head straight up the hill and into the woods! 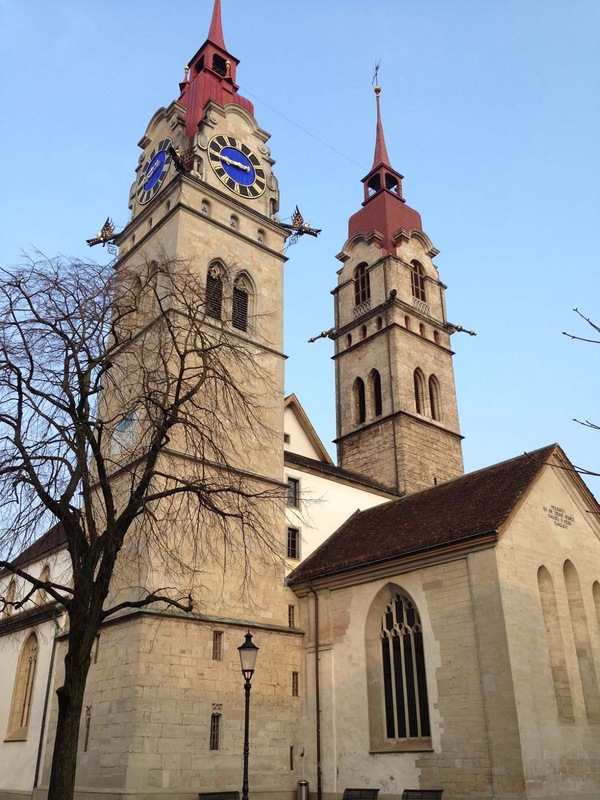 The city of Winterthur is surrounded by hills, as you could imagine for a Swiss town. 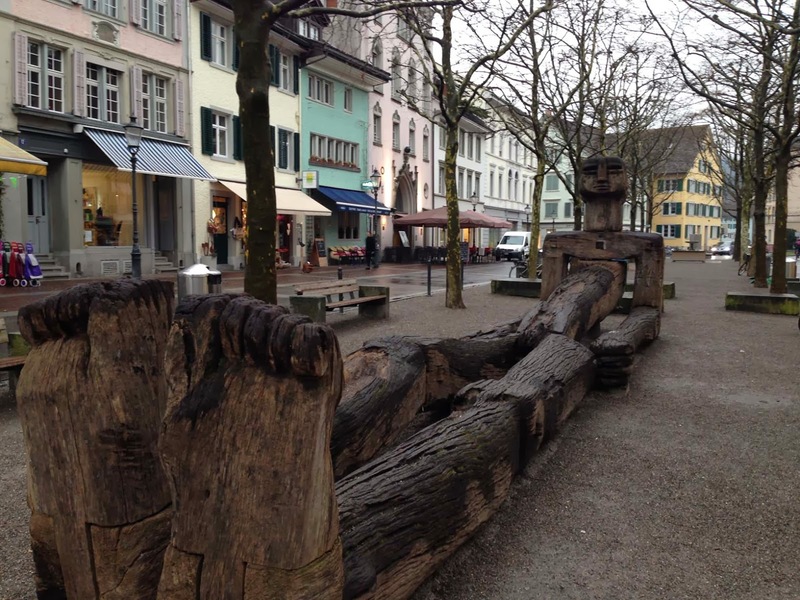 And Winterthur has some of the biggest woods of any town in the country. So the best runs take you up into the wooded countryside hills, which you can get to within minutes of the center, in the old town. This run heads south of town to Eschenberg hill, and loops across it past an animal park, through some farm fields, and then back again. We'll start the run in the heart of the old-town pedestrian zone, at the corner of Marktgasse (the main shopping street) and Metzggasse, next to the Krone (Crown) Hotel. There is a fountain there, the Justitia-Brunnen. So, if you're ready to go, head south along Metzggasse the three blocks till Technikumstrasse, a busy street just outside the old town. Cross the street and keep heading south, where it starts going uphill along Turmhaldenstrasse. You're now running up Heiligberg, the steepest spot on the whole run. Go up and over this little hill, where the street-name changes to Hochwachtstrasse. 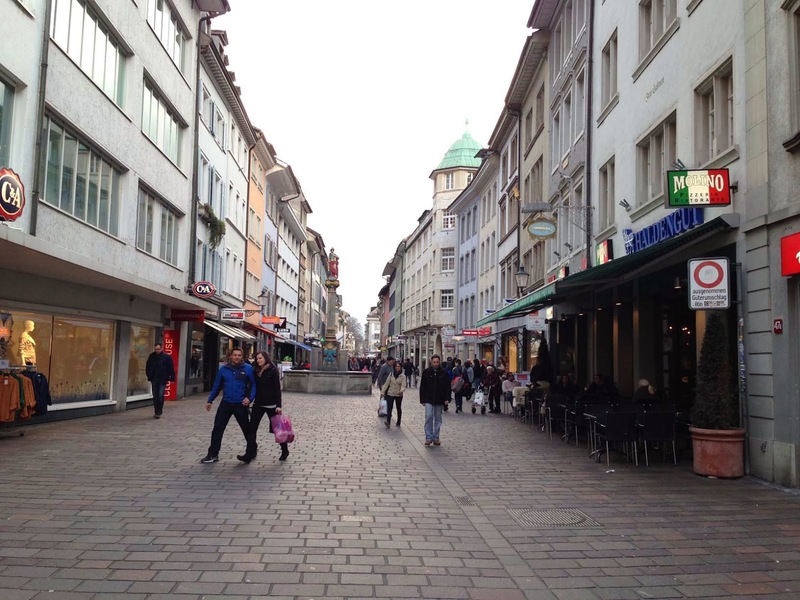 When you come to the next busy street, Breitestrasse, Winterthur ends, at about the 1-km mark. Now the road continues southwards going up the forest-covered Eschenberg hill. Cross Breitestrasse, then take the gravel path to the left of the paved road, following the signs for Bruderhus, Bruederhus or Bruderhaus (there are a few ways to spell it). The trail parallels the street all the way up. The hiking trail markers are yellow diamonds. 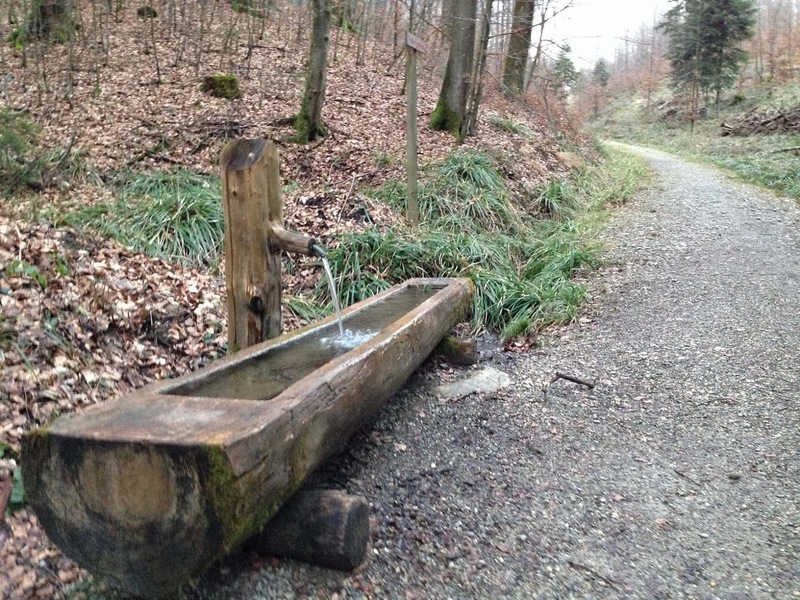 At a spot where the trail goes downhill for a short ways, there is a fresh spring-water fountain. At the fountain, turn right to continue following the signs to Bruderhus. When you get to the top of the hill, you'll see the farm buildings at Bruderhus, at about the 2.5-km mark. 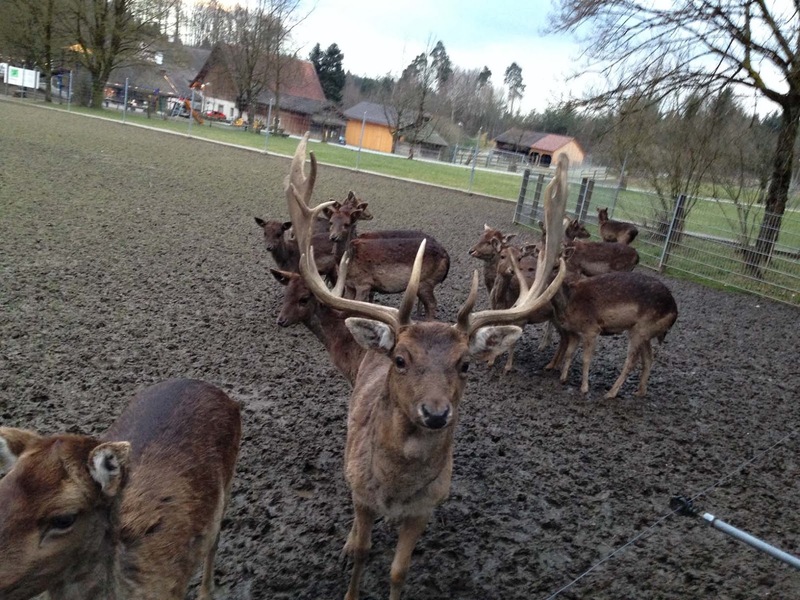 Bruderhus is an animal park, with deer, mountain goats, European bison (a smaller cousin of the North American ones), and other animals grazing within fenced meadows. Continue following the paved road. 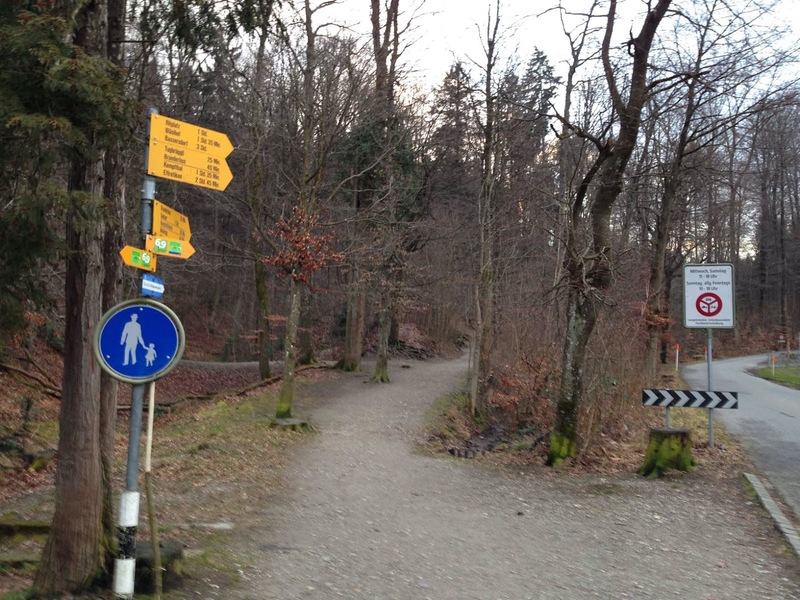 Right after Bruderhus, follow the Wildparkweg trail to the east, just to the left of the paved road, following the signs to "Eschenberg Seen". You are now running along a fairly flat hilltop for the next two kilometers. The top of the hill is to the left side, with occasional cross-trails heading up there to the 30-meter-tall observation tower. We're now running towards a farm on the other side of the hilltop, with a restaurant. 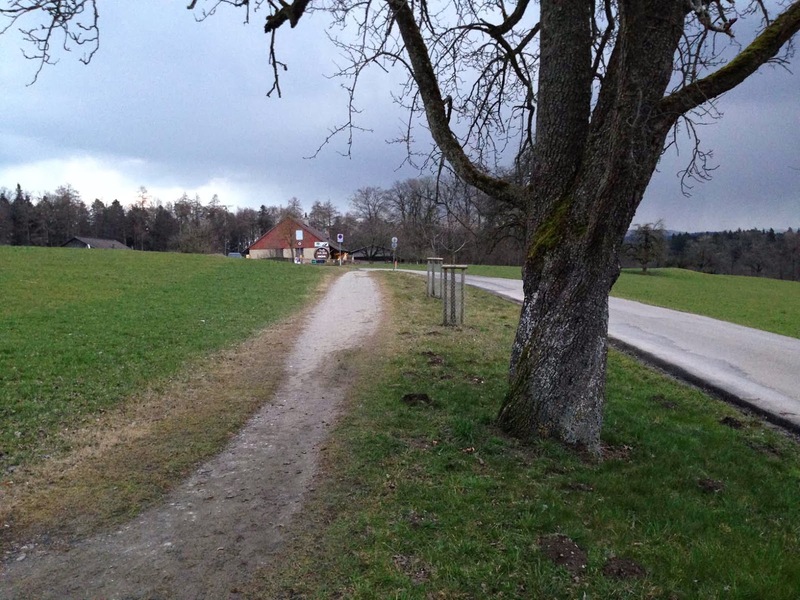 At the farm, the path rejoins the road in the open meadows. 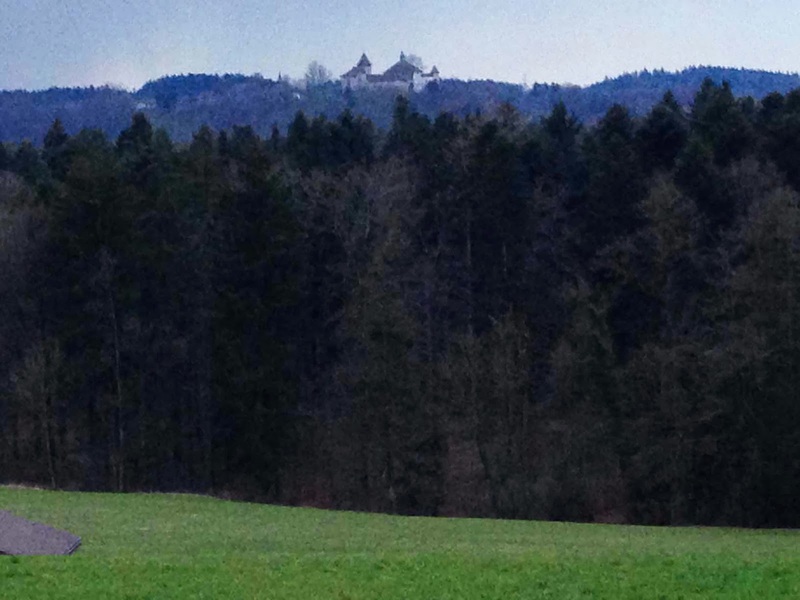 You can see the 800-year-old Kyburg castle on the next hilltop to the south (to the right). NOTE: If you want to go there, you have to first run down to the bottom of this hill and the back up to the castle, but that's another great run! Run straight to the farm's barn, then turn left onto the dirt path to the left of the paved road, at the 4-km mark. The path is marked for "Waldheim Bus". It soon starts heading downhill, back to town. Make sure you keep following the signs for Waldheim and not the ones that turn off to Waldegg. 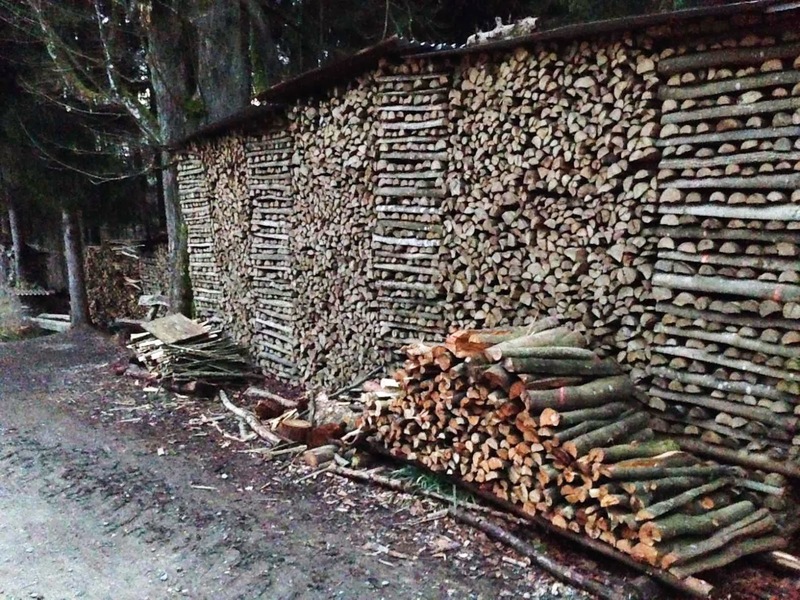 Remember, WaldHEIM, your Woods Home. The last part of this trail goes downhill steeply, merging into Langgasse, where you keep running straight, past some new apartments, after the 5.5-km mark. Cross Breitestrasse again, continuing north on Langgasse. The main street curves to the right and becomes Reitweg. Just after the parking lot on the left, at the fountain, turn left onto Wildbachstrasse. Now head north on Wildbachstrasse, cross the bridge over the stream and come out onto the loud intersection at Technikumstrasse. Cross the street, re-entering the old town along Oberer Graben, with its trees and park-like feeling. At the next intersection, turn left onto Marktgasse again and run westwards the last three blocks back to the starting point, past the fountain.